It seems Flint is not destined to be graced by the presence of Morrissey, former lead singer of the influential eighties band The Smiths. The Mancunian cancelled tonight's concert at Whiting Auditorium. This cancellation comes after he was a no-show at the original date in the fall. So that makes the score Morrissey 2 — Flint 0. Don't feel too bad. El Moz bails on a lot of shows. He's a delicate flower. It's the third Bay Area performance that Morrissey has canceled over the years. Fans arriving at his Golden Gate Park gig in 2004 were greeted by a burly usher shouting "The Morrissey's sick. No Morrissey today," which isn't a Smiths lyric but should have been. This time the excuse was simply "illness." Well, you can't say he didn't warn you. UPDATE: It appears it was the illness of two band members, not Mozzer, that led to the cancellation. All is forgiven! Apparently he was at the venue and left. I'm waiting to find out what exactly happened, because he cancelled here and postponed again everywhere else. Maybe he's just a jerk. two band members are ill (Tobias and Boorer) - no ill will towards your city. 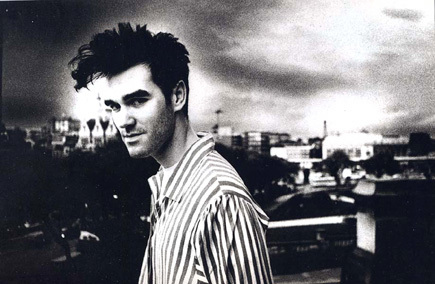 Detroit radio is saying that he is,or has been,being treated at Beaumont Hospital for a possible kidney infection.But,there is no one by the name of Morrissey ......according to hospital inquiries ,there. So, whatever. I don't know who you talked to in the Beaumont system, but per HIPAA they shouldn't tell you anything about the health condition of any patient there, and I'd certainly expect them to have a policy of declining to acknowledge the presence of a patient by name. So, perhaps the answer you got was misleading to you. Don't know who called Beaumont. All info came from a radio news story, and that's what was stated. Maybe that's not his real name. Or he uses another name at hotels and hospitals. I am just so tired of this guy and cancelled shows. He is the KING of Cancelled Shows all his life!!!!!!!! !